Here you can find all the latest news from nom HQ, including; brand news, reviews, interviews, recipes, and information on health and wellbeing. To receive the nom blog direct, click on the RSS icon above and copy/paste the URL to link to your chosen RSS reader. Whether just for fun or for as a self-sufficient food source, gardening is a great hobby. Nicky Roeber, Online Horticultural Expert at Wyevale Garden Centres, has these tips for vegan gardening and tells us why it’s important to go green. Vegan diets are on the rise thanks to movements like Veganuary getting a lot of mainstream attention but, when it comes to vegan gardening, there’s a lot more to be done. A significant portion of global greenhouse gas emissions are caused by animal agriculture, and by gardening using only plant-based products and endorsing a vegan lifestyle, we can all do our part to save our planet. Composts and fertilisers can use animal products like manure and slaughterhouse sludge, making them incompatible with vegan values. The easiest animal-friendly way to make sure your garden has enough nutrients is to invest in a compost bin. Fill it with vegan household waste, such as vegetable peelings, teabags and paper, and garden waste, such as grass cuttings and fallen leaves. A compost bin doesn’t need much attention, just a stir every now and then to help the process along and can produce nitrogen-rich vegan compost in as little as three months. If you’re planning on buying vegan plant food for your garden, look for ones that are free from fish, blood, and bone. Another nutrient-rich option for vegan gardeners is green manure, which is made from nitrogen-fixing plants rather than animal waste. As these plants grow and then decompose, they add nitrogen to the soil for plants that are unable to use the nitrogen in the air. Common nitrogen-fixing plants are beans and peas, which can also be used in vegan cooking and are a great source of protein and fibre. Pesticides are used to protect crops from being destroyed by bugs, rodents, fungi and weeds. However, they can cause the death of this type wildlife, which causes some debate amongst vegan gardeners as to whether they are acceptable to use. If you want to keep it organic, you can look for gentler ways to deal with pests in your garden, such as crop rotation. Crop rotation means growing a mixture of different types of crop per section per year so that they can all benefit from each other’s individual strengths. It is used to make sure that nutrients in the soil are all used up equally, rather than planting too many plants with the same nutritional requirements in one place. It’s also used as weed control, as crops with dense leaves like potatoes can protect other crops from weeds. The same technique can be applied to warding off pests: by rotating plants into different spots over the years, their corresponding pests in the soil won’t have a consistent source of food and your crops will thrive. While it may seem counter-productive, encouraging more insects into your garden is another alternative to pesticides. Some insects, such as ladybirds, eat pests as well as pollen and can be attracted by planting flowers and herbs like geraniums, fennel and yarrow. The impact of vegan gardening isn’t just limited to avoiding animal cruelty. If you make the most of your garden space by growing plants for vegan diets, you can reduce the need for trips to the supermarket and lower your carbon emissions. Replacing your flowerbeds with healthy vegetable plots, as well as fruit trees and lots of legumes for protein, means you’ll have a variety of crops for cooking with. You can also support local animals and birds by choosing plants that are natural habitats: trees, shrubs, herbs and grasses provide food and shelter, and bigger gardens can even accommodate a pond for drinking water and for frogs and newts to spawn. 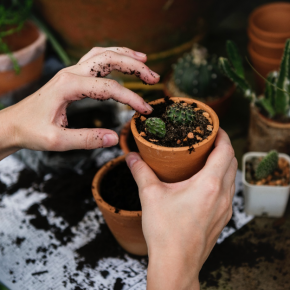 As with food and household brands, try to look for items in your garden centre with Vegan Society, Soil Association, or Ethical Company logos. These are more likely to produce eco-friendly products that are ethically sourced and traded, and won’t exploit animals, people, or the planet. It’s also good to get into the habit of looking for products with biodegradable or recyclable packaging to help reduce waste and ocean plastic, which can be harmful to marine animals and birds. With these tips, you’ll be well on your way to having a green garden of your own that you can be proud of. By using vegan products and methods, we can reduce our contribution to global pollution and animal cruelty, as well as having access to lots of healthy fruits and vegetables. Tag your Instagram photos with #nomfoods and we'll feature them here!